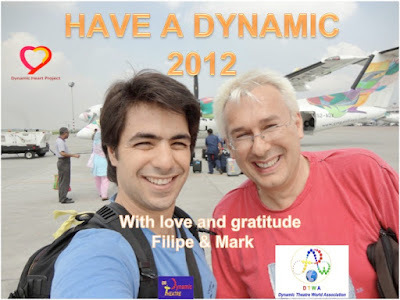 Our work continues with plans to continue our work with Dynamic Heart Project. Filipe recently gave a concert in his home village of Vimeiro to raise funds for DHP, the concert was supported by over one hundred people. We hope you enjoy these video clips from the concert. Our journey started from London Gatwick on Thursday afternoon 29th September via Dubai and Dhaka heading for Chittagong down in the south of Bangladesh. 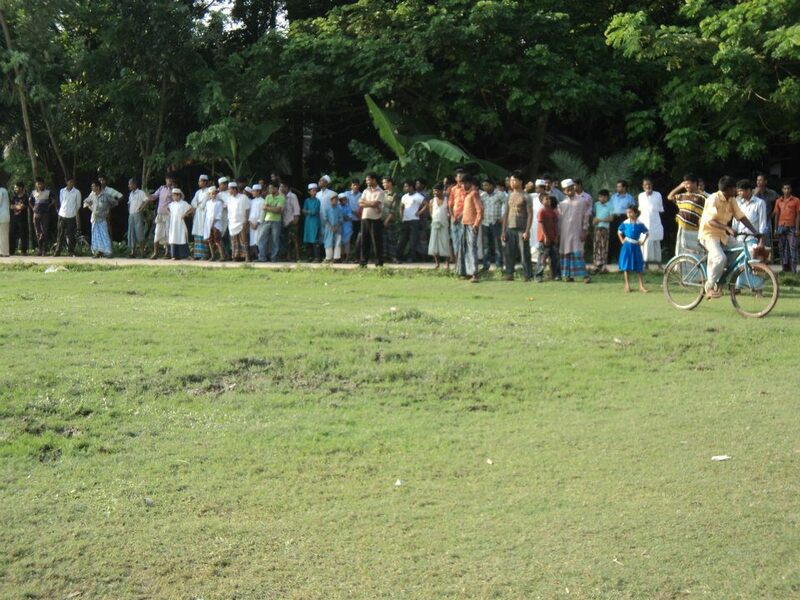 The story though starts 6 weeks earlier when Mostafa Kamal from Unite Social Theatre for Action (UTSA) in Chittagong put out a call for assistance to an international drama email group. He told us about the tragic accident that had happened in July, in Mirasorai, killing 43 boys and injuring many more. Being an experienced leader in Social Theatre Mostafa knew of the benefits that drama and expressive arts would bring to help this community deal with their loss. We read that email and saw it as a "Call to Action" and within 6 hours of saying "Yes" to Mostafa our first email went out to people telling them of our plans and asking for help to raise the funds we needed to go to Chittagong. By 11pm that same night donations had already started arriving, by the following morning we had received over £500. In the weeks that followed people donated from as far away as Siberia, China and Australia, all with much the same message "tell the parents my heart goes out to them, I'm reaching out to them through Dynamic Heart Project"
As well as personal donations we organised Dynamic Theatre workshops with proceeds going towards our trip, Filipe gave a fundraising concert in Portugal in early September, and so within 6 weeks we created the funds to travel to Bangladesh to be of service in the best way we could to the people of Mirasoai. This trip was just the beginning, we have plans to return to continue our work with the people of that community who in the face of tragedy opened their hearts and homes to us. They found it at times difficult to believe that people from across the world reached out to them through us to help them in their time of need. 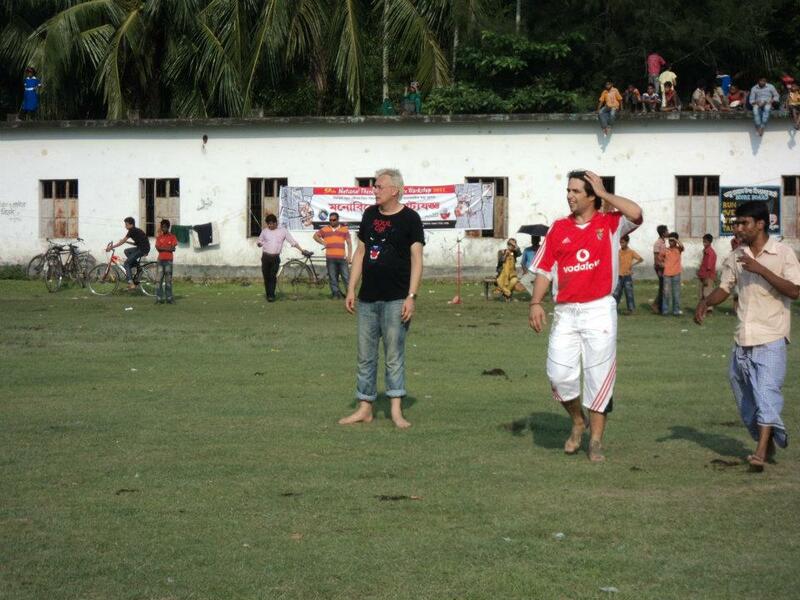 We arrived at Chittagong airport at 2.30pm on Friday 30th September. Mostafa was there to welcome us and take us to our guest house for a much needed rest before we started our journey into the soul of the people of Bangladesh. Thank you Mostafa for having the courage and the passion to live your dream through Social Theatre, and thank you all for sharing our vision of making a difference in the world through the Dynamic Heart Project. As part of our warm up to deeper work we have people work in pairs, one person is active whilst the other just listens. The active, doing person represents and improvises the "heart" of the person who is seated. It's always interesting to hear and see how our heart relates to us and if we take notice of what it has to say, maybe it has to act in strong ways to get us to take notice and make changes in our lives. This warm up exercise was one of the very first ones we created with Dynamic Theatre, it continues to amaze us, but then again it is the wisdom of the heart. We had four days to work and share Dynamic Theatre with people who were going to be coming with us to do field-work in Mirasorai. Thankfully everyone present was familiar with some form of action-methods so it made our teaching that much easier. Dynamic Theatre works mainly with the collective unconscious, the first part of our work was to encourage people to be even more spontaneous than they were already. To enable them to think beyond a role and to learn trust what their body and intuition is telling them to do and say we reminded them of childhood and how it was to imagine that a chair could transform into a castle or a spaceship. Filipe took everyone through exercises from being Super-Heroes to wild animals running or flying free in nature. Why? Because even in the most creative of arts we sometimes forget how to be spontaneous and our spontaneous becomes rehearsed and we lose touch with who we are and what we are meant to be doing. What better way to re-connect with inspired action than to reenact a classic fairy tale, Cinderella was chosen as the favoured one to perform, but to add another dimension to the story we asked people to enhance different emotions in the play. Yes this Cinderella story was told in the style of "sadness" and by literally over emphasizing the sadness so that everything became sad the only tears shed were by the audience crying with laughter as Prince Charming let out deep deep sobs as Cinderella's foot fitted the glass slipper. By encouraging people to become spontaneous and laugh until they are crying we free up a space in them which then allows that person to become a strong container and a good channel for more painful emotions. Plato said that you could know more about a person by watching them play for an hour than you could after years of just conversation. The more creative we become the more we learn to think outside of the box, the more we think outside of the box the more chance we have of imagining how it might feel to walk in someone else's shoes and see the world through another person's eyes. Neurobiological research shows that when we empathize or imagine how it is to be in the role of another, both sides of the brain become engaged and stimulated enabling us to feel connected to the whole. I am You, You are Me and together we are One. and carved until I had set him free"
Some people gave us money to buy writing books, pencils, and coloured crayons for the children of some of the slum schools in Chittagong. On our second day in Chittagong we were able to visit such a school and give each child a writing book, a pencil and a box of coloured crayons, with some left over for those who were not at school that day. Thank you to all who gave specifically for this purpose, it was a real pleasure to see how treasured these useful gifts were received. This is the school itself, it's a long room divided by three partition walls teaching primary school children basic maths and languages, including english classes. Leaving our message of good wishes and fulfilled hopes for the future for everyone at the school, as well as writing all of your love and good wishes. 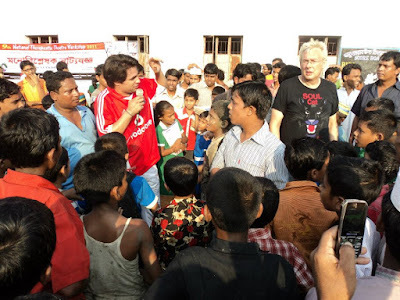 Social Theatre is used a lot in the slum areas to help people express their views and bring together the community to bring about change for the better. Here theatre is used for changing lives and to bring awareness of child trafficking. Here theatre saves lives. the sense of what it is to be a human being"
We were very lucky to have as part of our team Reza Aziz who is a very experienced Playback Theatre leader from Dhaka. In the picture above you can see Reza warming up the group for a full afternoon of laughter and self-expression. 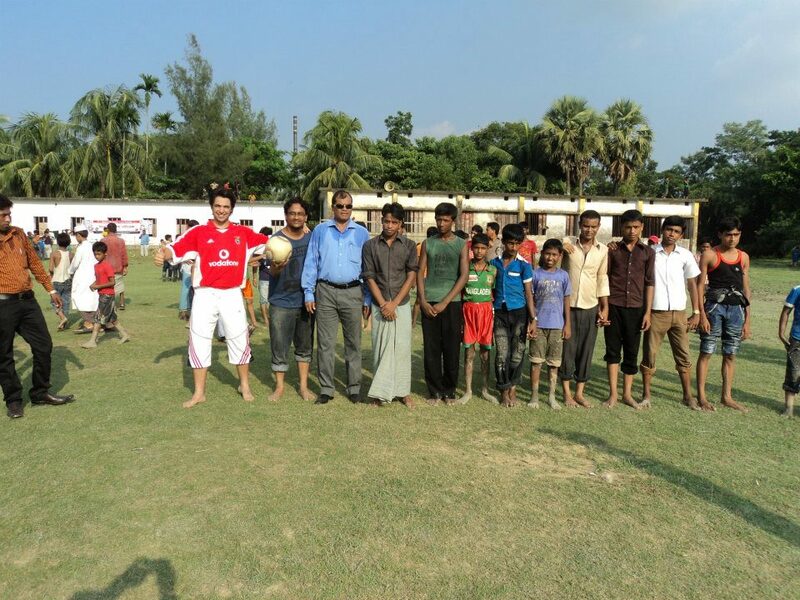 Despite a family member being seriously ill in hospital in Dhaka, Reza gave selfless devotion to bringing light back into these children's eyes, we were all certainly blessed by having Reza with us. We decided to have a more relaxed and enjoyable afternoon as the first day of our visit had been very emotional for everyone. Plus we wanted to make people aware that our work was not just about crying and dealing with loss, part of the process is to bring back laughter, nothing is quite as soothing than to hear children laughing uncontrollably. Some of the parents and elders came to the afternoon just to sit, watch and enjoy their children joining in together with other children. Some parents came to see other children play to honour their own children who were no longer there to enjoy the fun. The afternoon was bitter-sweet to see a father watching the other children play and laugh with tears in his eyes telling us how he had lost his only son. Whilst Reza and other team members worked with the children we were able to sit and be present for some of the Father's and Mother's who really just wanted to talk and to know that someone was there to listen. "Play energizes and enlivens us. and opens us up to endless new possibilities"
As the accident affected so many people in so many different ways we decided to create a spontaneous play using just five main characters relevant to the tragedy, no script, just improvisation. Our intention was to then invite those from the audience who felt moved to or wanted to say something to one of the characters or as one of the characters to come do or say what they needed to say. When tragedy occurs and life ends suddenly, those left behind often feel they didn't get to say goodbye or there is a need to say one last thing or embrace the person who has died one final time. It is our belief and that of many others in the field of Expressive Arts that drama can be a wonderful container and healing tool for expressing the unspoken words that can otherwise stay stuck in our hearts forever. It is possible for one person to represent and speak as a group of people. It is sometimes a very strong experience to take on the role of a group of people, especially a group in distress. Again we want to acknowledge our teams depth of compassion and strength of spirit to step into these roles so willingly to help begin the healing process of their fellow countrymen. To be able to create such a sacred space for healing we needed to unite everyone, so whilst Shishir and Sudarshan are connecting with the audience, the players (right of the picture) are centering and focusing together their intention of the work about to be done. and it is the love in my heart that makes the difference"
How do you react as a parent? These are the opening scenes from our improvised play, by making it as emotive as possible we aimed to offer a safe place for people to express emotions, for many these emotions had been held inside since the accident in July. Whilst we could not bring the children back we could allow people the sacred space to cry, grieve and join together in their pain and loss, by letting unspoken words be spoken, by letting a river of tears flow and allowing people to ride that stormy river we could guide them to the soothing and healing waters further upstream with the view of a new day dawning. By allowing deep emotions to flow through us we allow the healing process to begin. Problems arise when we block the flow. These two boys in the photo, one centre right and the other surrounded by a magenta cloth came into the play to say goodbye to their friends, in the end they sang a traditional folk song to honour and remember all the friends they had both lost. It enabled a cathartic process for them and for all their friends. We honour them for their courage of stepping into the centre of the river and allowing the tears to flow, in so doing their openness and vulnerability brought about healing not only for themselves but for their community as well. who walk the way of love"
Whilst working with trauma to begin with we also in the last days of our work wanted to sow seeds of a new beginning. What better way to create a sense of security and foundation than by creating home, each colour representing a different quality to add into the rich mix of making home, joy, happiness, togetherness, and a place for friends no longer physically present were just a few of the suggestions as to what needs to go into making a good home. When we were told we would be working with Class 5 we imagined maybe 30 children coming along but when 130 turned up we had to improvise fast. Working with a great team makes all the difference, together we were able to work in a fun supportive way, enabling the children to use their imaginations and at the same time express and experience their needs in a safe and supportive environment. Because of the amazing team we had we could at times just be there supporting the team in a supervisory way, like that the interaction and spontaneity could just flow without the need for translation. For us the laughter and smiles transcended all language barriers, here the language of heart and soul reigned strong. 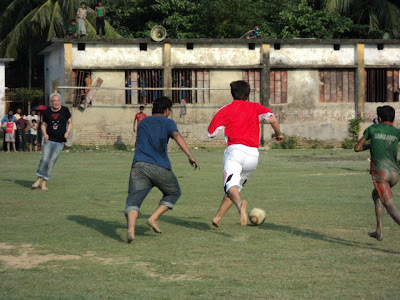 but to one person you may be the world"
As a way of bringing everyone in the community together and bring back the sense of joy and laughter to football again we organised a football match for our final afternoon in Mirasorai. We wanted to honour all the boys who died that fateful afternoon in July, all returning home excited and celebrating after winning a football match, little knowing a few hours later life would change forever. The local children decided they liked the idea of having England play Portugal in our honourary football match. Mark being captain of England and Filipe captain of Portugal. Eleven players soon became fifteen or more on each side as everyone wanted to be involved and join in the fun. It was a great joy for us to see smiles and hear laughter returning to children who had previously told us they would never play football again as so many friends had been lost to the accident. It was a great game supported by everyone from the community. We wanted to end our work with this game to bring back a joyful and positive attitude towards football, success and winning, all of which had been badly and sadly tarnished. By ending our work this time with football we hoped that people would then be able to remember the smiling happy faces of their sons, brothers and friends enjoying a game that unites people worldwide, and in that united feeling they would sense the love and support that reached out to them from people around the world. Back in Chittagong we met for a final debrief after our work in Mirasorai. Pictured here are the great men who volunteered to come with us, and together we worked, we laughed, we cried, and together with the help of the women who also volunteered, we supported the families, the children and the community come to terms with the loss of 45 young lives. Without these dedicated people who willingly gave up their time and holidays to work with us as a team we would not have been able to do and achieve the things we did in the community of Mirasorai. Through coming together as a group we learnt what made our team work effectively and cohesively, and also what separated us. Thankfully the team spirit and the vision of why were a team enabled us to move through challenging times, great humour and storytelling were great night time companions.